Kevin forgot Lindsey's birthday and didn't even buy her a gift......so Lindsey made Kevin into Kara....the submissive frenchmaid. Lindsey: Kara how do you like your mary jane heels? Kevin's girlfriend liz needed a ballerina for a photo shoot and kevin fit the measurements for the outfit to be modeled......kevin secretly yearned to be in a ballerina dress, tights, and slippers that he accepted to be shot....now if only he can keep his balance. 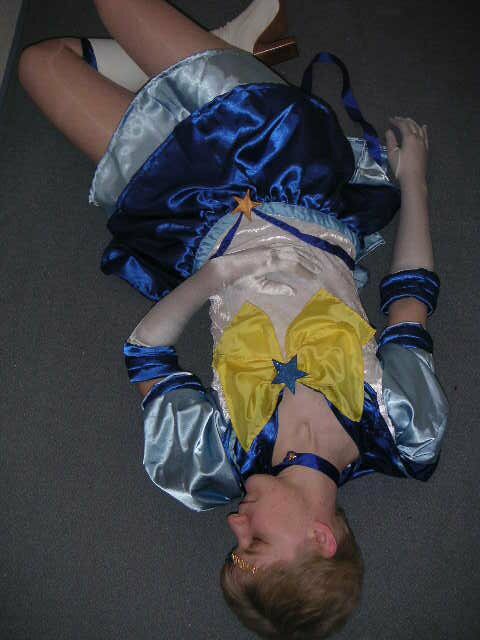 Kevin was out cold after his girlfriend slipped in a few sleeping pills....now he can accompany her to the anime cosplay convention since she needed someone to play the part of her lesbien lover sailor uranus......it was difficult to put the outfit on a sleeping person but the only real hard part was slipping on the pair of pantyhose without running them......she looks sooo sweet...heehee. as kevin awoke he loved the way he looked in a short skirt and pantyhose that he embraced his girlfriend liz.....as sailor uranus and neptune made out as lesbien lovers. Love the all, Krissy! Adore the two ballerinas! (blush) So cute! I love all of these Sissy Krissy, keeo up the fabulous work, and I will always be happy whenever I see your work. OMG I love te sailor scout outfits! Leotard and skirts and just too good together. Kevin was thinking to himself, this is the best Halloween costume ever.